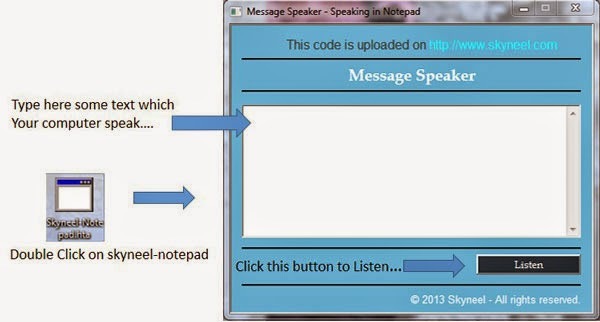 How to make the computer talk using code in a text editor program, Speaking notepad. 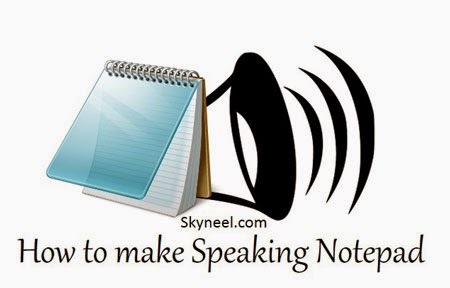 You can easily make your PC ready to speak what you want to type in the notepad. This is a surprising trick to your all friends or colleague. By using this trick your computer is ready to repeat the words whatever you type any kind of text. If you don’t have a programming background, you can easily use this trick. This trick is running properly on all existing. You have to have to take given some easy to use steps and your specific Text to the Voice software which ready to work. Without any doubt, you can definitely impress with your all family members, friends or colleague. Let’s start this tutorial with some easy steps. Step 1: Open the Notepad either from Start >>> All Programs >>> Accessories >>> notepad or Press WIN + R key the type “notepad” in Run box. 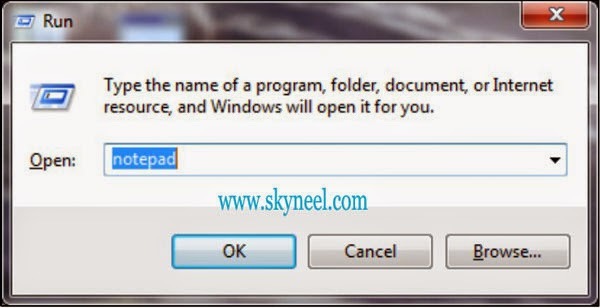 Step 3: Now, please save this file in notepad with the name Skyneel-Notepad.hta at your desktop. Step 4: Now, double click on the Skyneel-Notepad.hta file and type any text in the box whatever you want your computer to speak for you. Step 2: Now, please save this file in notepad with the name Skyneel.vbs at your desktop. Step 3:.Now, double click on the skyneel.vbs type in the box. Your computer is ready what you want to hear from the your computer. Note: Before running this script, disable your antivirus for few time others this file will be deleted by your antivirus software. It’s a really very nice and funny trick to which you can use to impress to others with your own computer skills.